My birthday was in November. As I make a special menu for each member of my family for their birthdays, my brother and mother have been doing the same for me. This was the second year that they had made me a special birthday dinner, chosen by me. I generally pick relatively easy things (I don't think I am going to suddenly whack them with a seitan roast or homemade sausages... though they are both improtant life skills), but it is always a delicious dinner! Here are my miniony monkeys... cook monkeys... COOOOK! 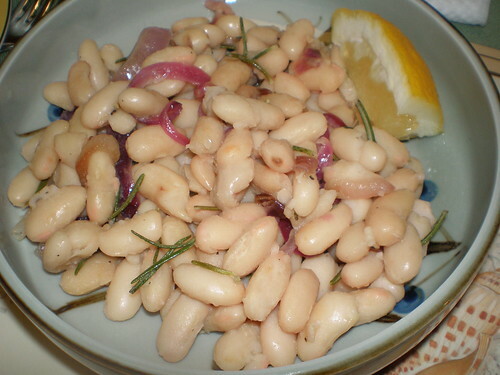 My first course was Rosemary White Bean Salad, from Donna Hay Magazine issue 44 (May/June 2009). This is delicious, just fantastic flavours and so simple. 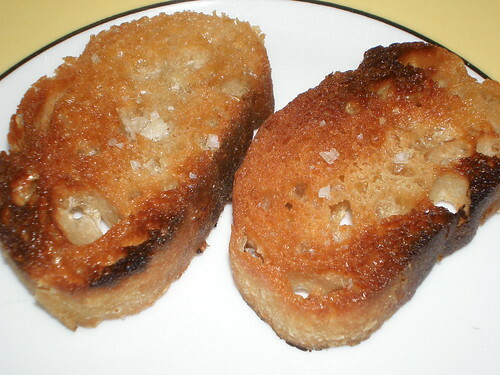 With some grilled baguette on the side. Nom! 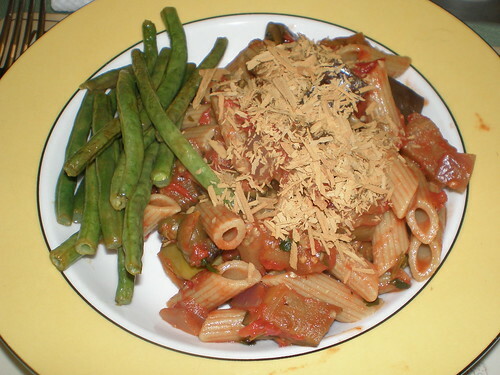 The main course was Penne With Eggplant Caponata from Delicious Magazine May 2009 and a side of Lemon-Broiled Green Beans from Eat, Drink and Be Vegan. A wonderful combination! Sprinkled liberally with nooch of course. 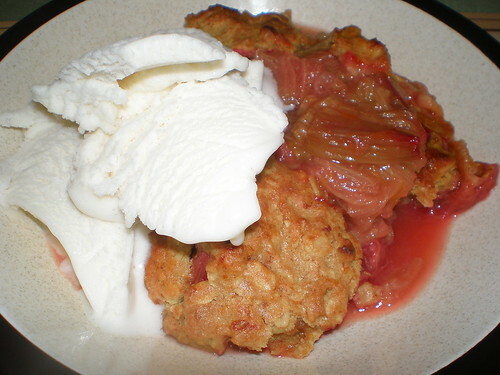 And dessert was a Rhubarb Crumble, from the Maggie's Kitchen cookbook. I LOVE rhubarb, and this was great! Next up - more birthday celebrations and a post-birthday picnic! This is a beautiful photo of my beautiful first kitty ever Mo. 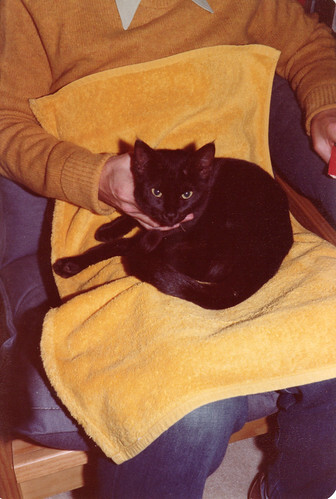 I think this was quite soon after my parents brought her home - which means I wasn't even born yet! I have returned after a random and rather lengthy break from blogging. I cannot be sure why I was not, I just wasn't. Part of it may have been a recent change in my job structure. I used to do a 30 hour week with three nights on call, which sucked the big one after doing it for two years! But now I am FREE! 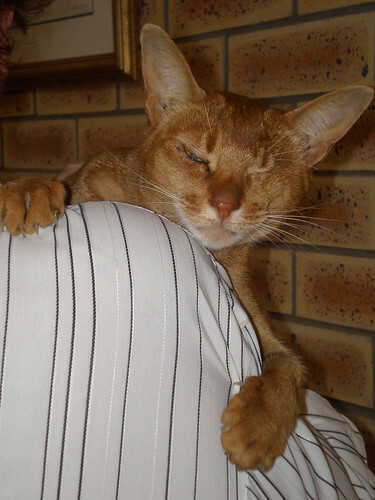 Oh yes, I am just your regular 38-hour-a-week with no on-call vet. WOOT! Surely this should mean more time for blogging? Well, there has been some adjusting to working several very long days in a row... equally a tired Susan. A tired but happy Susan. And now I am pretty much adapted to my happy new work life, so here I am! Even though I have been away from blogging, I have still been very busy cooking, baking, taking food photos and - of course - eating! 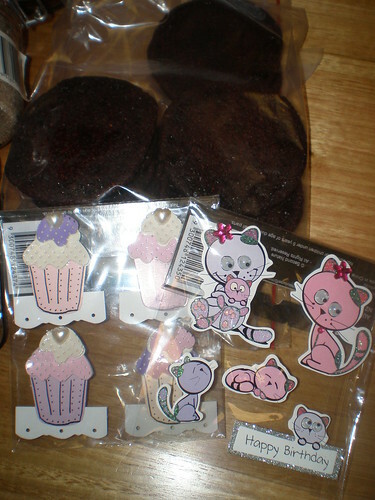 Plus as an added bonus, some adorable kitty and cupcake stickers, because she knows I like to scrapbook. 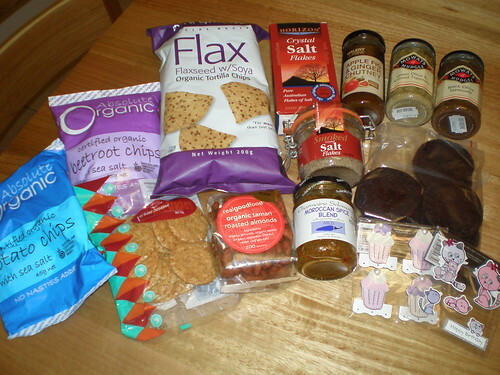 What a great package - thank you so much Mandee. :D I am still enjoying many snackages from it. Anyone who gets Mandee in a swap is going to be very happy indeed! I have so many photos to catch up on, so expect some pretty food photo heavy posts coming up soon!